Pico projectors are all the rage these days. Their compact size and low price make them the most affordable way to enjoy video on the big screen, but there are trade-offs. 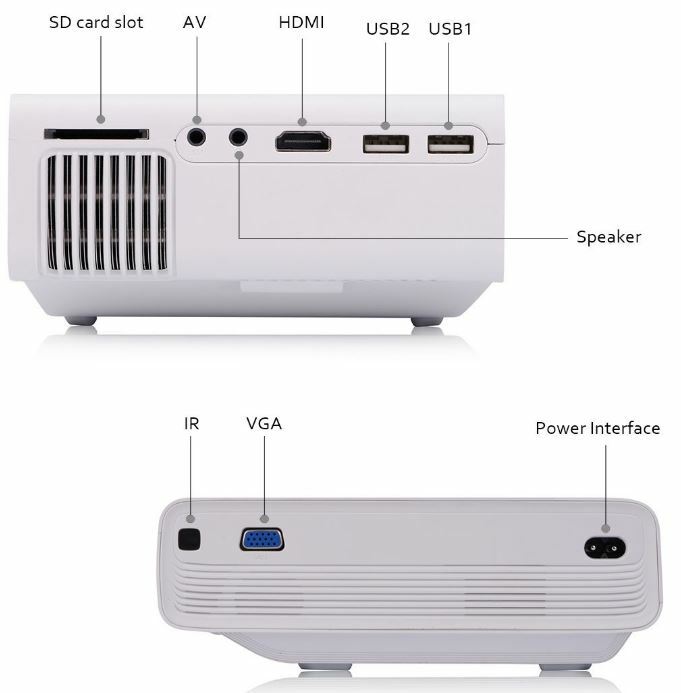 Many pico-projectors have conservative hardware. They often have Sub-HD resolutions, and produce low levels of brightness. If the room is too bright, the image can appear washed out. If the screen is too big, the low resolution results in a sub-par image. 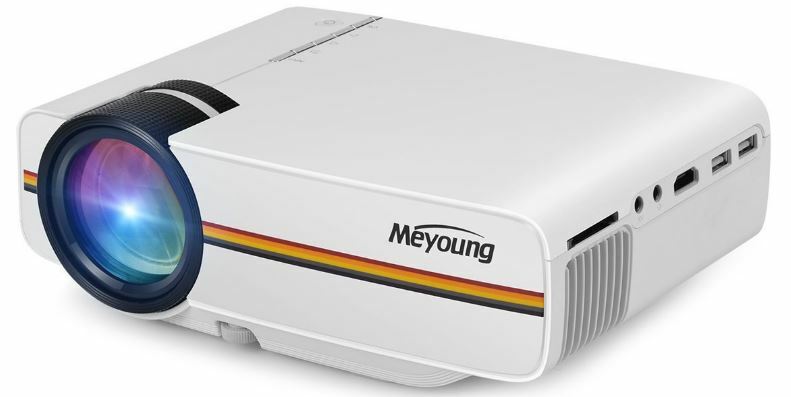 We had the opportunity to try out the Meyoung TC80 Portable Projector. The manufacturer compromised by making it a little larger than competing models. In exchange, the specifications are a little more impressive. Would this projector make a good addition to your home theater room? We went hands-on to find out. Meyoung took the most common projector design and added a little bit of retro flare. The boxy layout features a large lens on the front, and all of the ports on the side. The cooling vent is place right next to the ports, which keeps the entire front nice and clean looking. The projector is available in both white and black models. With the lens offset to the left side, Meyoung used a rainbow stripe to divide up the empty space. The look is strongly reminiscent of the classic Polaroid camera, and makes the projector quite appealing. The two focus rings stick out from the top of the enclosure, making optical adjustments quick and easy. All of the controls are located directly behind the lens, keeping them accessible when needed. 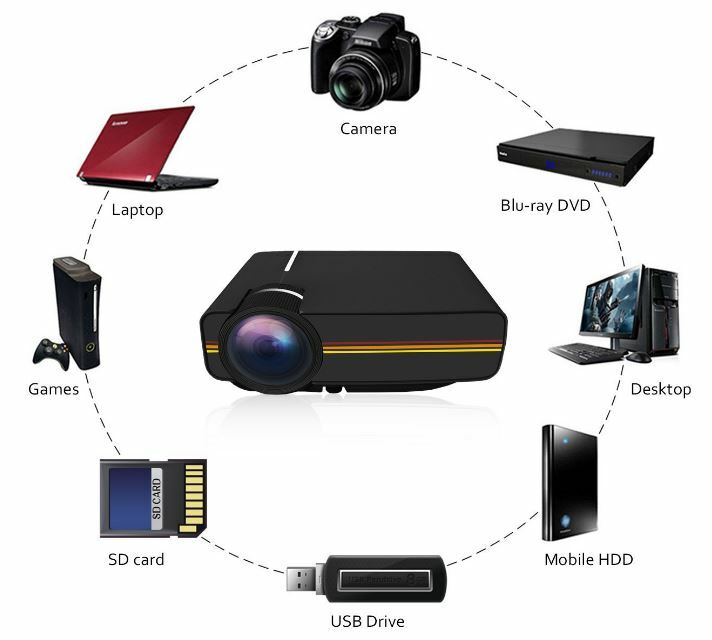 If you have a laptop, game console, or Blu-Ray player, connecting them to the projector is a simple process. Any HDMI source plugs directly into the side, so there are no adapters or converters necessary. This HDMI port supports MHL, which allows you to use it with a wider range of devices. Streaming sticks like a Roku or Chromecast will work right out of the box, and either of the two USB ports on the side can supply power. MHL also gives you the ability to connect your smartphone or tablet. You will have to purchase a separate Micro-USB to HDMI adapter for this to work. But because the projector supports active MHL, any inexpensive adapter will work correctly. The USB ports aren’t just for power. They can also be used to access external storage. Hard drives, flash drives, and SD cards plug right in. The projector has a built in media player, so you can enjoy your favorite content without any external sources. 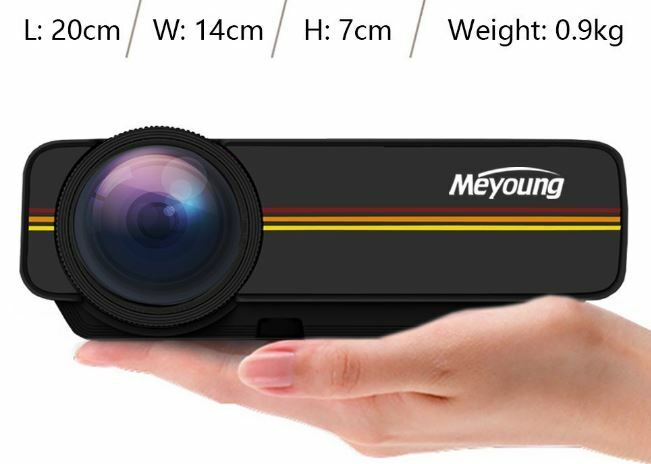 Although Meyoung markets this projector as a 1080p model, the actual native resolution is 800 x 480. This widescreen resolution is roughly half as detailed as HD, but twice as detailed as SD. Since content is rarely available in this resolution, the projector reads everything at 1080p and downscales it. With affordable projectors, this practice is extremely common. But how does it look? Well, that all depends on how large your screen is. Up to the 60 inch mark, video is definitely enjoyable. You do lose a little sharpness, and the fine details are lost. But the loss in quality isn’t quite as dramatic as changing a YouTube video from 1080p to 480p. The projector doesn’t add any digital nose, it simply reduces the resolution. If you’re looking for something to be your primary display, we’d recommend choosing something with a native HD resolution. In this price bracket, a used television may be your only bet. However, content is still enjoyable at 800×480. If you’re looking to do the occasional outdoor movie night, or just want a portable way to take big-screen video with you, this is a fantastic alternative. One of the biggest disadvantages of portable projectors is the brightness. We often encounter models that have a light output below 200 lumens. At these levels, projectors need to be used in complete darkness to be watchable. Even then, the screen is still fairly dim. But this model produces 1200 lumens of light. This number is consistent with many full-size projectors. This gives you a lot more flexibility in the types of environments you can use it. In direct sunlight, 1200 lumens aren’t enough. Indoors, all you have to do is dim the lights to enjoy it. Keeping a lamp on is fine, and having a little daylight coming through the windows won’t overpower the display. If you want to use the projector outdoors, just wait until the late afternoon when the sun starts to go down. The brightness of a projector plays a huge role in how good the image looks. With a dim bulb, video appears a little faded and washed out. With a enough light, colors are bright and vibrant. But the lighting isn’t the only factor. A projector also has to be able to control it will. It needs to be able to block out light well on the dark spots. The LCD technology in this model is a cut above the rest. There is a huge difference between black and white. Higher contrast means sharp, vivid images. The colors are vibrant, if not a little over optimized. This is ideal for movies and television. The display looks cinematic, and does a great job or recreating the atmosphere intended by the producer. 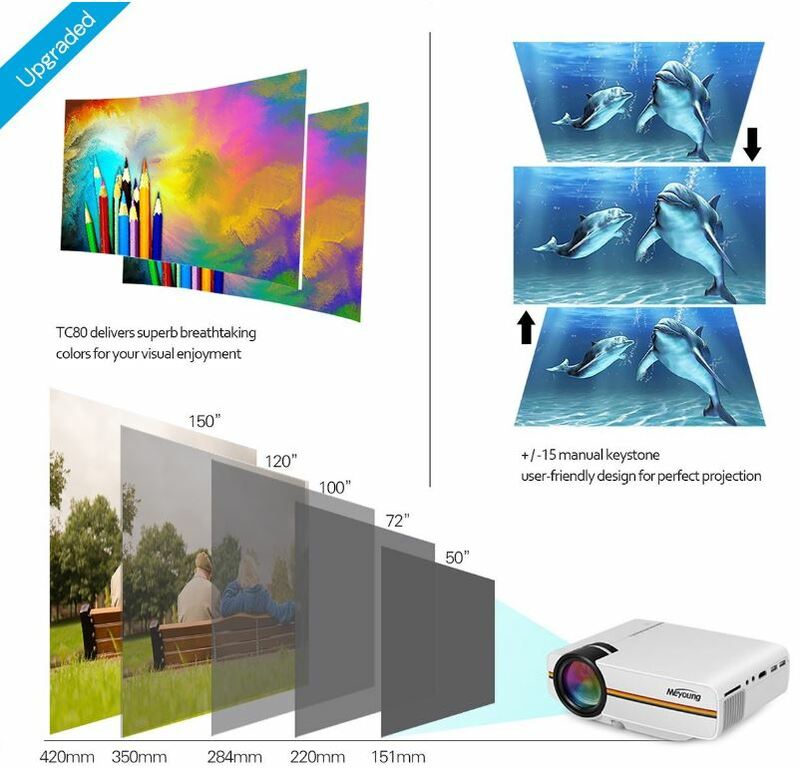 The impressive colors are one of the biggest advantages to this projector when compared with alternatives. 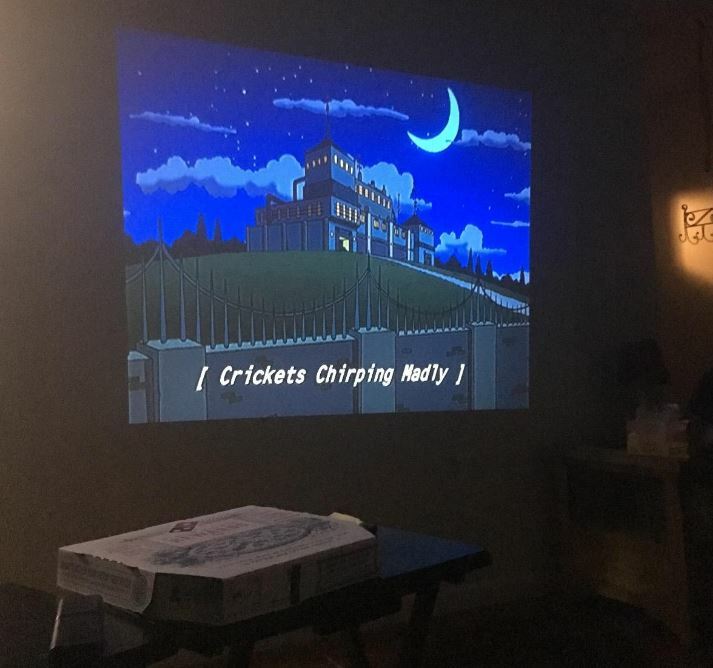 This plays a large role in how enjoyable it is to use this projector. The optical system in this projector allows you to create a screen that ranges in size from 50 inches to 120 inches. In our tests, the image looks best between 50 and 60 inches. This does give you a slightly more limited range than some models. It has a throw ratio of 1.4:1. This means that for every one foot of distance between the projector and the wall the screen will be 1.4 feet wide. To get the ideal screen size you’ll want 5 to 6 feet of distance between the projector and the wall. In a pinch, you do have a little flexibility. But going beyond this range can impact the video quality. If you plan to use the projector to play back video files from an external storage device, you’ll want to make sure that the file formats you use are supported. MPEG1, MPEG2, MPEG4, DivX, and Xvid are all supported. This isn’t the file extension, but the encoding of the video. This means that the majority of AVI, MPG, FLV, and MKV files will be supported. The projector does support other options, but most of them are fairly obscure. It also plays back most audio files (like MP3 and AAC) and image formats. The downscaling system in this projector is ideal for movies, television, and gaming. But there are a few environments where it simply won’t produce a high quality image. Anything with lots of text is a write off. You’re not going to want to use this for power point presentations, nor should it be used as a display for your computer. 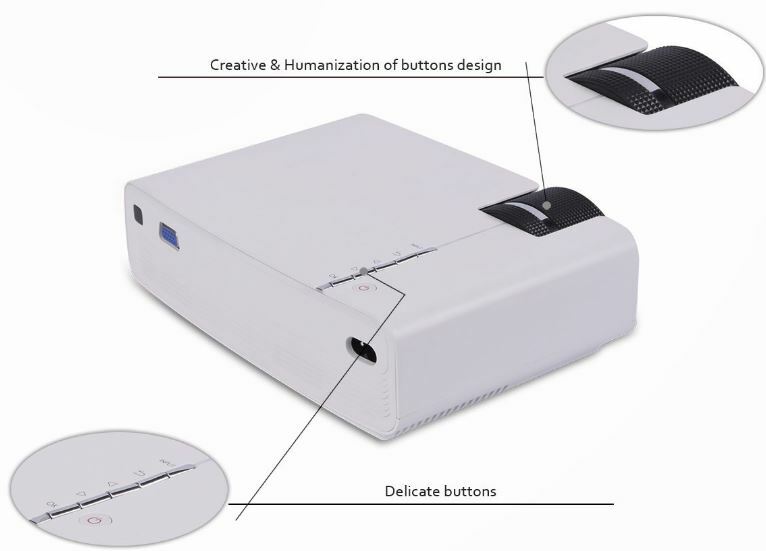 Some multimedia projectors can be used for display, and some display projectors can be used for multi media. But this is a one-or-the-other situation, so you should make sure that this suits all of your needs before making a purchase. In an ideal world, we’d recommend a projector that has both high brightness and a full HD resolution. But at this price bracket, you’re going to have to make compromises. Which feature has the largest impact on video quality? For movies, brightness is the most important. A low resolution bright image looks significantly better than a dim high-resolution image. For the money, that makes the Meyoung TC80 one of the best options out there. The connectivity options cover most applications, but some users might find them to be a little limiting. Even if you don’t have the port you need, this projector can still be used. If you want to use a VGA video source such as a laptop, you can use an HDMI to VGA adapter. If you’re playing classic video games or using any analog SD video source, the resolution of this projector won’t impact your video quality at all. These devices can be connected with a Composite to HDMI adapter. If the size of this projector is putting you off, there are plenty of portable options to choose from. We compared a few select models in our roundup of the best portable pico projectors. If video quality is of greater concern, investing a little more will get you a nice 1080p projector. Though the costs can range drastically from model to model, our best projectors roundup compares our top choices. one of the usages for this projector would be outside, running off a DC to AC converter> how much power does it use?? How big a dc/ac converter does it need?